Sometimes in Japan, it feels like all the good retro game stuff has been snapped up by famous retailers. That, or it’s fetching a premium on internet auction sites. Yet, if you look, there are definitely neat finds. Just ask Twitter user Daitora. While in the city of Ome for a local festival, Daitora popped in a small electronics store called Kubo Kaden. There he found a stack of Family Basic, a programming suite for its Famicom (NES) console that was released in 1984. The post-it notes read “Family Basic” and “Brand New” in Japan. The price of this retro piece of Nintendo gaming lore? Three thousand yen—or $26.60. 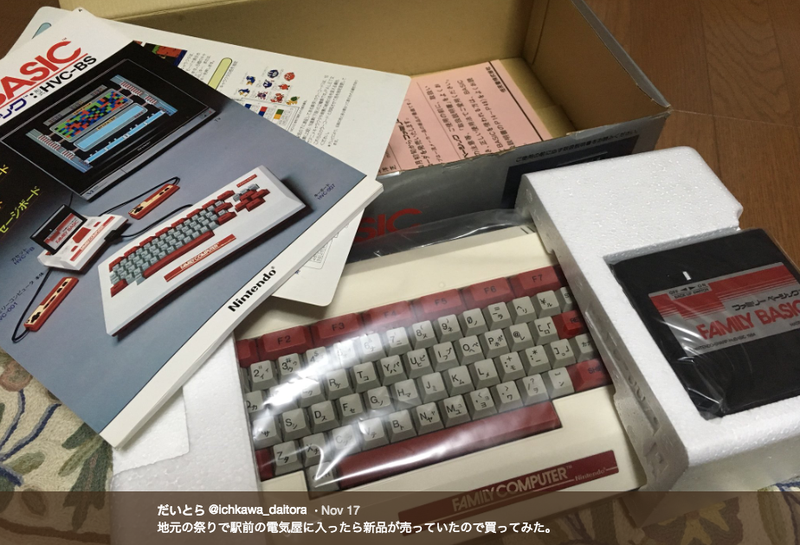 As Daitora’s photos show, the Family Basic appears to be mint, in-box with what looks like the original packaging. Used (and opened) versions of Basic fetch between around $70 and $120 at online auction sites. This, obviously, would fetch much more. After the tweet went viral in Japan, Daitora swung by Kubo Kaden again, but all the remaining Family Basic hardware seems to have been sold. If you visit Japan and are looking for interesting finds, it might be worth checking out small electronics shops off the beaten path. You might turn out gems that have been sitting on shelves for years.